There’s a picture of Parris Williams shaking hands with President George H.W. Bush on his living room wall. He’s very proud of it as it reminds him of the time he ran for the South Carolina State Senate for District 44 in 1984. “I was interested in bringing the community together and preserving our heritage,” said Williams, smiling. Parris Williams, a fifth-generation James Islander and Reverend at the First Baptist Church of James Island, lives in a house he built with his own hands at the age of twenty-three on a road that shares his name and the name of his grandfather. Now 67 years old, Williams has dedicated his life to helping his community and preserving the heritage of James Island and the Gullah/Geechee Corridor. He was there for the first incorporation of James Island as a town and now serves on the James Island Council. However, with County Councilman Curtis Inabinett’s announcement that he will not run for his seat as representative for Charleston County District 8, Parris Williams has thrown his hat into the ring and will run for Inabinett’s seat in Charleston County’s November elections. District 8 covers most of Johns Island, part of James Island, Edisto, Ravenel, Hollywood and part of rural West Ashley. As its representative, Williams feels that he would listen to the district’s residents and do what the majority needs, starting with infrastructure. While serving on the James Island Council, Williams served on the town’s Public Works Committee –a position which allowed him to work closely with RoadWise and the SC Department of Transportation. While on the Public Works Committee, Williams saw to the paving of six dirt roads on the island, the building of a sidewalk from Folly Road to James Island Elementary, the launching of the road project at Camp Road and Folly Road, and the pending installation of a traffic light at Camp Road and Dills Bluff Road. While Williams hopes to help install drainage where necessary throughout District 8, he also hopes to work with the area’s infrastructure; fixing roads while also helping to preserve the area’s rural nature – especially Johns Island. “We don’t want to lose our farmland and green space,” Williams asserted. Actually, perhaps this should be considered a paid political advertisement or at least reported as such when financial disclosure time comes around for candidates. If the reporter isn’t merely reporting campaign material provided by Mr. Williams, it is difficult to tell why this glowing report. Anyone who would use their affiliation with James Island Town Council to try and promote themselves to higher office really has a lot of gall. And maybe that and the “heritage” card is all one needs these days to garner enough votes to get elected. The James Island Messenger and other local publications provide reports of dysfunctional Town Hall meetings, with much bickering and contention over a relatively small matter of covering a ditch. And now Mr. Williams wants to be involved with County-wide drainage problems? can make an informed decision when elections roll around. This is an amazing article as one of the paved dirt roads was Rev. Parris Williams Road. Is this important? Yes. There are many other dirt roads that have many more people living on them than Rev. Parris Williams Road, but somehow they are NOT paved. 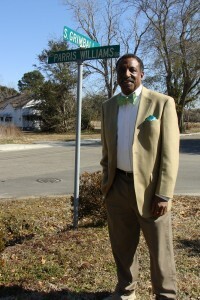 In his terms on the Town of James Island council, Mr. Williams has listened to only one voice. He is the one councilman who has never voted against Mayor Clark, thus becoming the perfect “yes” man. Who’s voice would he listen to on County Council? He has not listened to constituents in six years, so it does leave a question not answered in your puff piece.